Find the Perfect Kitchen Set for You! Whether you’re just starting out, or have been cooking for decades, T-Fal promises that the T-Fal Ultimate Stainless Steel Copper-Bottom 12-Piece Cookware Set will give you the essential cooking pieces you need, in an attractive and useful set. With basic pieces you’ll use every day like the 8″ saute pan and 2.2 quart saucepan, you’ll find cooking fun, enjoyable, and best of all – easy to clean up. The saute pans have gently curved sides to allow you to easily flip food or slide food out of the pan to a platter or plate. The saucepans are useful for endless everyday cooking activities like heating up or making sauces and soups. After reading many reviews, it was pretty clear that the T-Fal Ultimate set ranked highly with the majority of consumers who used it. Read my in-depth cookware set review to see what consumers had to say about this practical, attractive set. The T-Fal Ultimate Stainless Steel Copper-Bottom 12-Piece Cookware Set is constructed of stainless steel with a multi-layer base encased in stainless steel. The base has a thick aluminum core, excellent for conducting heat and ensuring even heat distribution. The aluminum core has a copper disc that further ensure even heating and helps to eliminate hot spots. The copper also helps to prevent warping of the pots and pans. The handles are riveted stainless steel that are ergonomically designed to be comfortable. There are hanging holes found on each of the handles, so that the set may be conveniently stored on racks or hooks. Finally, the T-Fal Ultimate Stainless Steel Copper-Bottom 12-Piece Cookware Set is topped off with secure fitting glass lids that have stainless steel loop handles. This is an attractive set. Highly polished, shiny stainless steel lends a professional look, and yet is neutral, so it will fit in nicely with any kitchen – modern or traditional. Reviewers found the pots and pans to be thick and sturdy looking. One of the comments noted was “It is the best good looking cookware I have ever seen”. Glass lids seem to be very popular lately, and the T-Fal stainless steel cookware set takes advantage of this rising trend. It’s always nice to see your food while cooking – without letting nutrients and juices escape! One thing to note is that the set doesn’t have lids for the saute pans. This may not be an issue for some cooks, but something to be aware of before purchasing the set. The T-Fal Ultimate Stainless Steel Cookware Set is oven safe to 500°F. Extreme caution needs to be taken when handling these pots and pans if they’ve been in the oven. It goes without saying that the stainless steel handles and surfaces will get extremely hot. Suit up with those oven mitts before handling! T-Fal covers the Ultimate Stainless Steel set with a Limited Lifetime Warranty. Right off the bat, the set looks tough and durable. It appears well made and reviews I’ve read seem to indicate the T-Fal Ultimate Stainless Steel Copper-Bottom 12-Piece Cookware Set holds up well under lots of use. One person did mention that the set is rather lightweight and was concerned that that may be be a problem with durability; but, overwhelmingly, consumers thought the T-Fal Ultimate Stainless Steel Copper-Bottom 12-Piece Cookware Set performed well and would last for a long time. While the manufacturer states that this cookware set is dishwasher safe, I wouldn’t recommend it. To keep the T-Fal Ultimate Stainless Steel Copper-Bottom 12-Piece Cookware Set looking like new, hand washing is recommended. Overall, consumers found the set easy to clean and didn’t have too many problems with food sticking to the pans. In the event of stuck on food, using a stainless steel cleaner pad or Brillo pad can help to loosen it up. 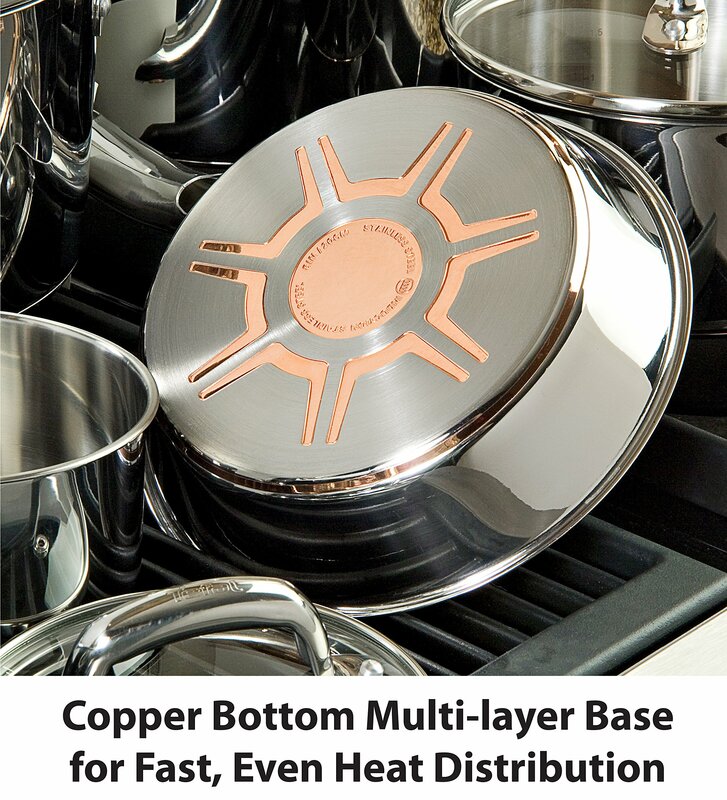 Users love the copper bottom, which facilitates even heat distribution. Copper conducts heat very well, and this was verified through consumer comments that mentioned that food cooks evenly and the pans heat up evenly. Even consumers that were hesitant to try stainless steel cookware had positive things to say about the T-Fal Ultimate set. One reviewer was considering stainless steel after previously using non-stick pans. She was concerned after reading about other users having trouble with food sticking to stainless steel pots and pans. After using the T-Fal set, she stated that she loved the set and has not had issues with food sticking. The price of the set was a feature that reviewers also commented on often. For around $100, the T-Fal Ultimate Stainless Steel set is very reasonably priced. According to consumers, the quality far exceeds the price tag. Several people mentioned that the set is well worth the price. One reviewer pointed out that you could spend upwards of $500 on stainless steel cookware, but felt it was silly to spend that much when you can get great quality for far less money. Another reviewer stated that the T-Fal stainless set is “the best bang for the buck”. Not to be overlooked is the appearance of the set. Stainless steel cookware tends to have a modern, contemporary look that lends a professional appearance to any kitchen. The T-Fal Ultimate set is no different. Many users on Amazon mentioned the attractive looks of the set. One reviewer said it is the “best looking cookware” she had ever seen. There weren’t too many negative comments about the set. Perhaps the most common complaint was that food sticks. If you’re switching from non-stick pans to stainless steel – there IS a bit of a learning curve. Lower temps should be used when cooking, and it’s wise to use some type of lard/oil with foods that tend to stick. For those times when foods do stick, a little Barkeeper’s Helper will help restore the pots and pans to great condition. The only other negative mentioned more than once was that the handles do get hot. To play it safe, I would recommend using pot holders when moving them around. Overall, I have no qualms about recommending the T-Fal Ultimate Stainless Steel set as good, lower end stainless cookware. For the price, the quality is decent and you really can’t go wrong. Stainless steel is a bit harder to clean than nonstick – until you get used to it! To keep copper gleaming, use a little bit of catsup to polish the pans occasionally. Cookware Reviews Guide is a participant in the Amazon Services LLC Associates Program, an affiliate advertising program designed to provide a means for sites to earn advertising fees by advertising and linking to Amazon.com. Copyright © 2019 Cookware Reviews Guide. All rights reserved.